The god Smith falls to the call of the blood. He massacres hundreds of mortals in Vigil, earning the aspect ‘Butcher’. Silt, an apprentice to Justice, discovers a powerful secret when he kills the Butcher. He finds that there is power in the blood of a god… power that comes from killing a god. When Silt shares his secret, a war between the gods begins. Five hundred years later, the gods are nothing more than myth. In Trel, the priesthood rules in remembrance of the gods. In Atherahn, the Butcher’s Cult wields power through blood magic and death. In Lock, the atheists deny the gods and kill anyone with magic. But the gods are still scheming in secret… which is common among gods. Their schemes have ensnared three mortals. Trin, Wilt, and Jem are trying to escape the gods without bringing the god of Death to the world in Death’s Merchant, the first book in the Common Among Gods epic fantasy series. Click here to get your copy today! 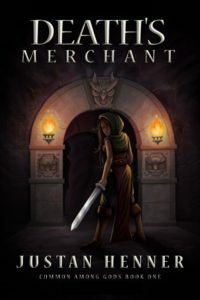 You can read Death’s Merchant for FREE on Kindle Unlimited.